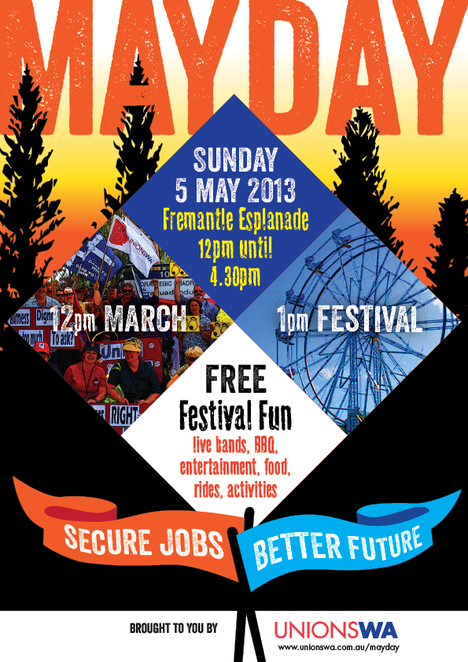 This Sunday, May 5th, the annual May Day Festival will commence at 12pm with a march through Fremantle, commencing at Fremantle Esplanade, Marine Terrace. Led by Beleza Samba Group, follow your ears through Norfolk Street, South Terrace and High Street. The march is to celebrate the victory in achieving the eight hour work day in Australia and the festival traditionally plays a big part to help recognise the achievements of working people. The festival is supported by UNIONSWA with free live entertainment, rides, family activities, performances and sausage sizzle. To kick off the festival, once the march is complete guest speaker Minister Bill Shorten will take to stage to highlight current campaigns. This will be followed by various live entertainment featuring bands with DJs in-between each. Live entertainment will be provided by Fremantle's own original party band Dilip N the Davs who will get you bopping and moving with their uptempo music and good vibes. Also for your entertainment will be Pimps of Sound who deliver high energy DnB tunes with a vibrant show, including their trademark style which is a fusion of latin, jazz, afro beat, jungle and hip hop. Free show rides for the children including bouncy castle, toddlers tent, bumper cars and an obstacle course. Parents can also test their strong man skills! Enjoy the free rides between 1.00pm & 4.00pm. As well as this already jam-packed afternoon, there will be roaming entertainment provided by the Beat Knickers who show off their circus skills to the tunes of mini guitars and bongos. A festival favourite will also be there in Old MacDonald's Travelling Farm and if that is not enough to keep the children entertained, there is also free face painting from 1pm to 3.30pm. All the children's entertainment is kindly sponsored by Slater & Gordon Lawyers. Union and community stalls are there for you to browse through and are held by a variety of union and community groups. You may be interested in having a chat to hear what they are passionate about. As is tradition, a free sausage sizzle will be open to all from 1.00pm. Following their success from the Bathers Beach Saturday Night Markets, the tasty treats from the Sunset Markets foodstalls join in on the May Day fun. Try their selection of festival ready food, from burritos to doughnuts which will be on sale throughout the afternoon. SUGGESTED THINGS TO BRING: picnic rugs, sunscreen and good vibes. Bring your family and friends to the Fremantle Esplanade to celebrate and have a great day!